"Can you kick off Gimme Shelter? You know, the Keith Lick?" "Nice!" I thought "Now THAT's a PRO!" The Seminal Whirlies and The Grand Candy had a very fine time celebrating Keith Richards' Birthday on Friday Night with a little help from our friends. Thanks everybody for coming out, even with the threat of the snow-pocalypse looming overhead. Thanks for getting a little shelter from the storm with us. The four bars above are pretty close to what Keith plays on the second pass through the chord changes. He plays each pass subtly differently, but you'll have to listen to that and figure out his subtle voodoo yourself. It's arranged in several 'Keys'. Here it is arranged guitar in Open E, Open G, and Standard tuning. 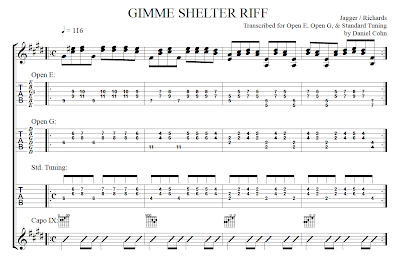 To be able play this song and be able to fake an orchestration of all of the parts on one guitar, I recommend Open E.
I also included a line of acoustic rhythm guitar at the bottom, playing essentially the guiro rhythm from this song. If you're learning this lick and have a buddy who can strum some open chords, have him capo at the ninth fret and strum the chords E, D, and C chords indicated really lightly near the bridge of his acoustic. Of special note: I notated the Key as C#minor, even though the tonic chord is major in this tune. Every other chord in the song borrows from the parallel minor key, so it made the notation more clear to use the C# minor key signature. 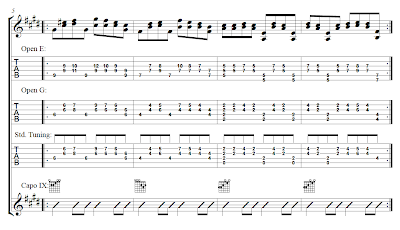 I hope you enjoy playing this riff. Labels: Arlington , gimme shelter , guitar lessons , Keith Richards , music lessons , the rolling stones , washington D.C.